So far the weather looks good for Friday’s attempt at Mt. Washington. Because of our plan to meet our crew up at Doublehead later in the day we have a short window to bust a move up the mountain and make it back down to meet up with the others. Ben and I are leaving town by 4:30 AM to hit the trail head at about 6:00. 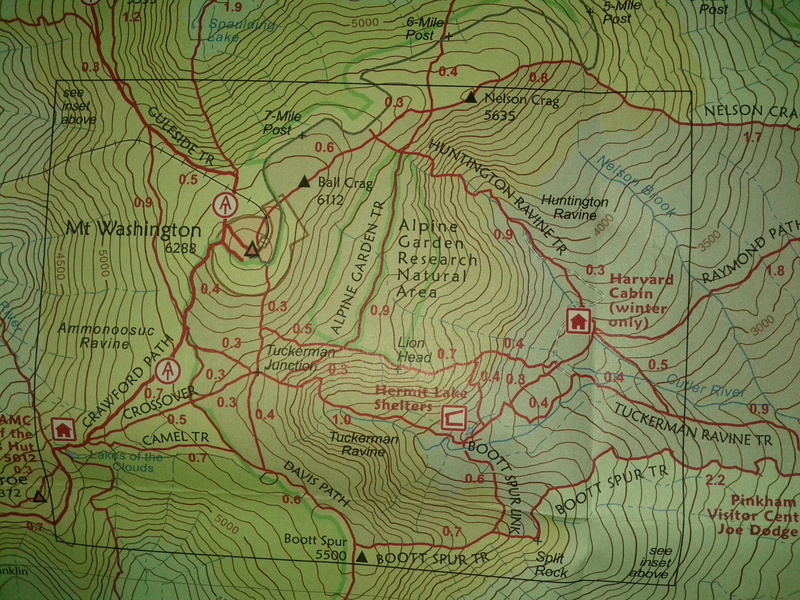 We then plan on hiking as far as we can until around 10:00 AM at which point we are going to make our way back down. Our target: Leave Pinkham Notch on the Tuckerman Ravine Trail to the Lion Head winter ascent trail. Then from there, it is Lion Head to the top of the head wall, back to Tuckerman Ravine Trail and perhaps even up the cone. The question will be, how far can we make it? This will be some of the most advanced winter hiking I’ve done and I am anxious for the experience. There is no real time-trial for this hike for training purposes, just out cut-off time to turn around. This is just because we can and to gain a little more experience in some relatively advanced conditions. The goal is to go for it, have some fun and see how far we can get. This also, of course, means that I will be clicking “refresh” on the Observatory’s website constantly for the next 36 hours. Things look okay for now, but tomorrow will be the last “go / no-go” check until we take off in the morning. From there, we will be assessing the weather as we go. If it looks shady, we’ll probably just hike to the base of Tuckerman and check out the early morning scene before heading back down to join the gang at Doublehead. In the meantime, it is time to pull together my gear and get things organized. It will be a fun weekend of hiking! This entry was posted in Hikes and tagged Hiking, Lion Head Trail, Mt. Washington, Tuckerman Ravine, White Mountains, Winter Hiking. Bookmark the permalink.